The composition and design of a field hockey stick is extremely complex, and it’s just not possible to cover everything you need to know in one blog. However, I’ll give you the best breakdownof a basic stick make-up, so stay alert. By the end of this blog, you’ll be incredibly knowledgeable about stick DNA, so that no company will fool you with their supposed stick make-up, and how it helps your game. Why do I say this? Because price and what a stick is made of do not always go hand in hand. You can find a great stick for your game without having to empty your wallet. And, pro athletes know it’s not just about the graphics (even though we love them too) we want you to know what’s underneath the cool colors and designs before you buy. Check out our field hockey stick matching app. After taking a little quiz, we'll show you three results of sticks that fit you, your playing style and price range. How are Hockey Sticks Made? Every stick begins with a mold; these molds are bought or made by each field hockey company. Most companies will create their own mold so that they can differentiate themselves from other stick companies. Molds are expensive, mind you, so some companies may not have the resources to create their own. In this case, they pay an outside source for a mold, or use another company’s mold to make their sticks. 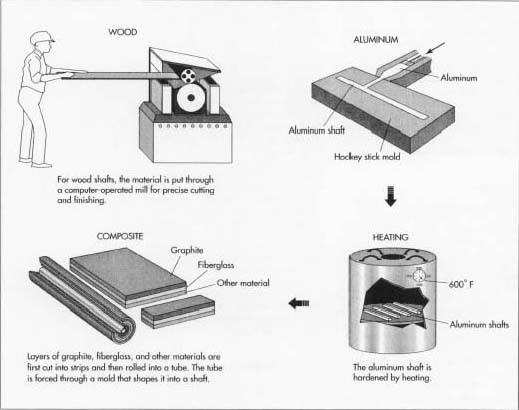 You may be thinking, “What is a mold?” and the easiest way to describe it is the shape of the stick. To put it simply, the mold consists of the toe of the stick in addition to the shaft. Once the mold is made, the “ingredients” of the stick are added. Think of it like a waffle maker...yes, a waffle maker. The mold of the waffle is those small crisscross patterns. The crisscross pattern of the mold is a bit like the head shape, bow shape and placement. You add the mix, bake that sucker for a bit, and voila, you have your waffle, or, stick. You follow me? To make you even more confused about molds, I must point out that every single field hockey stick mold must meet the appropriate dimensions assigned by the FIH (International Hockey Federation). Any stick that exceeds any of the proposed limits can be deemed illegal for play, and may not be used in a hockey game; this is especially checked at the international level. Be careful to make sure any stick you buy adheres to these standards or you won’t be allowed to use it in the game (and, yes, coaches have tools to check stick size and specifications.) Have you ever seen an umpire use a ring that they put around and move down the stick before the start of a game? That’s what they’re doing. If the ring doesn’t pass safely around the whole stick including the toe; if it gets stuck, then you got it, it’s illegal! Now, what is a stick made out of? One of the biggest keys in knowing what is right for you is what your hockey stick is made of (i.e. the composition materials) in the stick. Carbon, fiberglass and Aramid (Kevlar) are usually the materials that make up the stick itself. Sometimes companies add other materials in there as well, but these are usually the main three. What does all the stuff do? Fiberglass: this is a less expensive material that is woven together to help prevent wear and tear on the stick. Aramid / Kevlar: this material is used to strengthen the stick and is used as a higher quality substitute for fiberglass. Mulberry: wood was traditionally used (and still is) for some sticks. In the 1950s, other materials became more popular and replaced it. Mulberry has a lot of give to it to it’s great when you’re getting your feet wet with field hockey. So, what’s in a stick? Plain and simple the composition of your stick and whether you’re playing field hockey with the right one can be a huge factor in how you play the game. For one, a higher carbon content will usually make the stick a little bit harder to play with. These days athletes sometimes want a ton of carbon, but make sure you’re ready before you spend lots of money on a high carbon stick. That’s right mom and dad, the more the carbon, the more money that might be coming out of your wallets. Second… fiberglass is a great material that helps soften the feel of the stick. So, whenever you trap (stop) a hockey ball and your hands feel soft, you can thank the fiberglass in your stick for that. Remember that egg and water balloon toss you did as kids; think give with it as your coaches told you. Lastly, just remember that the highest amount of carbon in the stick does not mean it is right for everyone. A higher percentage of carbon will make the stick harder to play with! We at Bquipped know how important it is to play with the right stick and how hard it is to figure it all out before you spend oodles of mom and dad’s cash. If you can test before you buy definitely try to. Please feel free to visit www.bquipped.com to learn more about specific stick models and what materials they are comprised of. Each company has their own “recipe” or make up of their own sticks so expect there to be slight modifications from brand to brand.